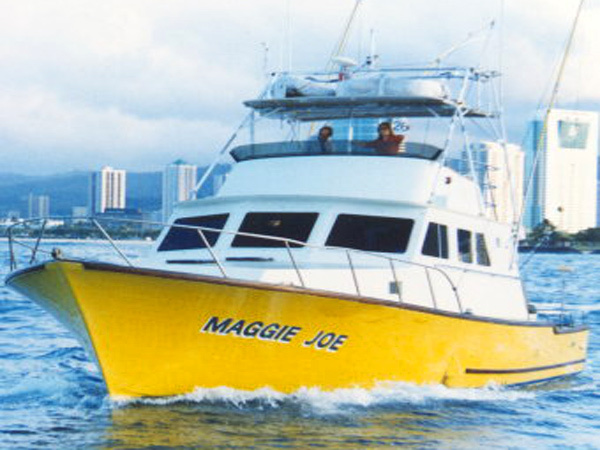 The Maggie Joe, a 53' Custom Sportfisher, designed especially for sportfishing in Hawaiian waters. The Ruckus, a newly refurbished 38' Bertram, an air-conditioned vessel with a shaded fly bridge and a maximum capacity of 6 passengers. The Sea Hawk, a 41' Tollycraft with a large shaded bridge and a new custom interior. The vessel has been recently refurbished and repowered and is very fast and very quiet. It has a maximum capacity of 6 passengers. These sportfishing boats are all part of Inter-Island Sportfishing. This is a great way to go on a shared trip with a private feel. Full-day trip is 8-9 hours. Half-day trip is 4-5 hours. All boats are quipped with Penn & Shimano 2-speed reels.